How to carry a stand up paddle board: Stand up paddle boards actually have a handle in the center to make this easier. How to put a stand up paddle board on a vehicle: This can be done by lifting the board and putting it on top of your car or by resting it against the back of your car and sliding it up. How to strap the board down: The best straps for this are cam straps. Almost all stand up paddle boards have a handle in the middle of the board for carrying. All you have to do is stand the board on its side with the bottom of the board facing you and the nose facing forward. Then, just grab the handle and you’re set to go! It’s important to have the nose of your board facing forward so that you can watch it and not let it hit anything like your car or the ground; the front of your board is fragile and it’s extremely important to make sure it doesn’t get hit. When you pick up your paddle board, bend with your knees. Keep your back straight as well. This prevents your back from getting injured; an injury can ruin your trip! If a strong wind comes by point your board into the wind. Stand up paddle boards are big, heavy objects, and the wind can easily use that against you. You could be forced to drop your board, potentially hurting yourself and the board. If it’s too difficult to carry your stand up paddle board yourself, buy a cart. Let’s be honest, stand up paddle boards can be heavy, so don’t feel bad if you don’t have the strength to carry one! Put your paddle between the board and the arm that you’re carrying the board with. This makes it easier and lets you have a hand free. Depending on your vehicle, you may have an easier time transporting your stand up paddle board. Trucks are fairly simple; just slide the board on its bottom into the bed of your truck, and you’re set to go. For those without trucks, the most common option is to put the stand up paddle board on the roof. 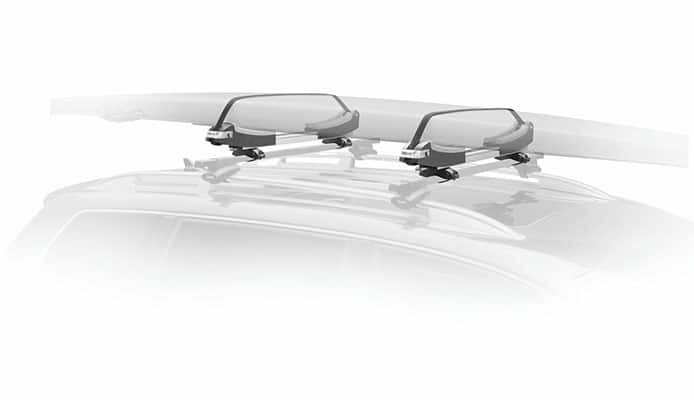 Crossbars: These go across the roof of your car, attaching to the front and back of your car depending on your vehicle type. They make crossbars for truck as well, so trucks are able to transport things on the roof too. 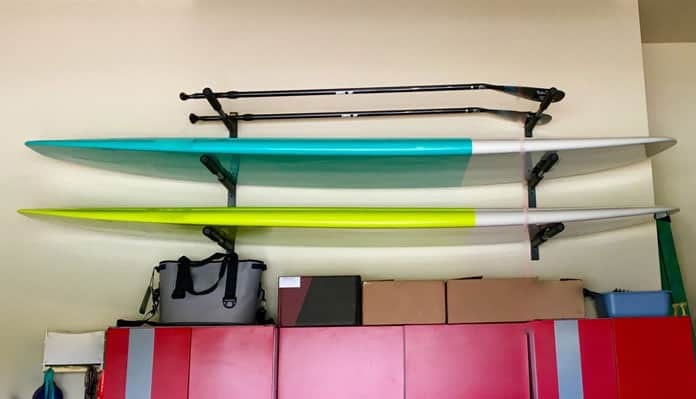 Rack/padding: You can get a specific stand up paddle board rack system to make this process easier, quicker, and secure. However, you can forego buying this and use foam blocks or other padding as well. Cam straps: You’ll want to get two 12-foot long or longer cam straps in order to actually hold your board on your vehicle. Bow and stern lines: If you get special ratcheting lines, it’s a lot quicker. However, you can use any nonstretch, water-proof rope. You’ll need two: one for the bow and one for the stern. Once you have all of this and the rack and/or padding put into place, it’s time to place your stand up paddle board on your vehicle. If you’ve got two people, each of you just grab an end and place the board on the rack, making sure that the fins are toward the front of your car. If you’re by yourself, this process is a bit trickier. You’ll need to go through the following steps to transport your stand up paddle board by yourself. Put your board against the side of your car with the belly of the board facing the car and the fin towards the front of your car. Put one hand on the handle and your other hand on the upper part of your stand up paddle board. Pull the board up onto your knee and grab onto the other side of the stand up paddle board with the hand that was on the handle. Pick the board up over your head. Place the board face-down on the top of your vehicle, making sure it’s on the rack or padding. Lean your paddle board against the back of your vehicle, keeping it face-down and the fins forward. Slide the board up onto your vehicle, lifting the end on the ground to make this easier. Another option for any kind of vehicle is putting it in the back seat. 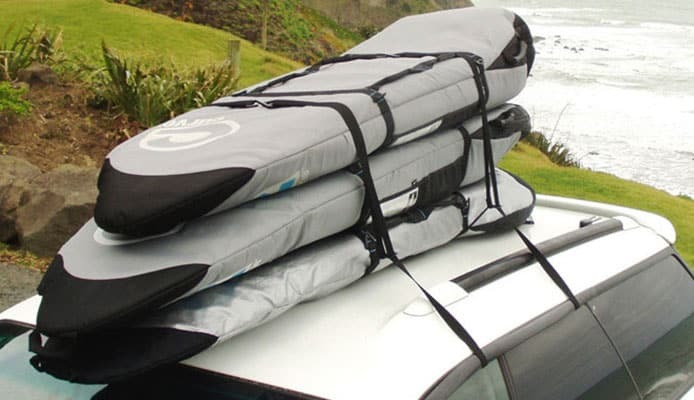 This is depends on the size of your board, but many people can throw their stand up paddle board in the backseat and roll the windows down, successfully and easily transporting their board with little hassle. 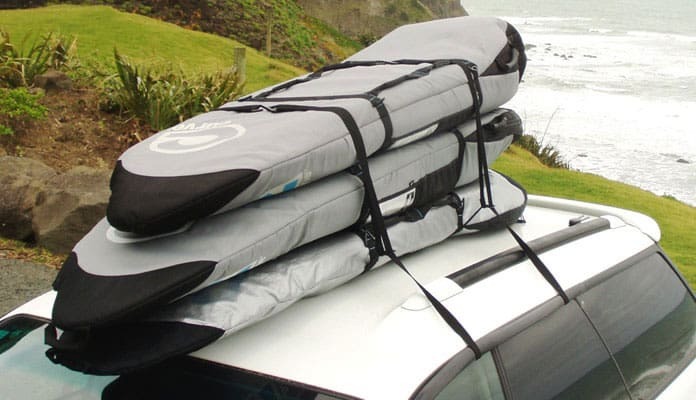 If you have an inflatable stand up paddle board, then transporting your board is easier. Inflatable stand up paddle boards deflate and roll up into the size of a sleeping bag, so they can be tossed in the backseat quickly. If you do have an inflatable stand up paddle board, then make sure it’s not near anything that could puncture or tear it. Remember your paddle! If you can, slip the paddle into your vehicle. If it doesn’t fit, then you can get a paddle holder that hooks onto the rack on top of your vehicle. If you have multiple stand up paddle boards, make sure to put the longest one on first. This way you can stack them on top of each other securely. If you are bringing multiple paddle boards with you, put padding between stand up paddle boardthem. You could easily damage your boards by letting them be transported without any padding. If you have a truck, make sure to pad the tailgate. This is just as important as the padding on the roof of your car. Padding also helps reduce the amount of moving around it will do in the back as well, which is another thing to pay attention to when transporting your stand up paddle board in the bed of a truck. 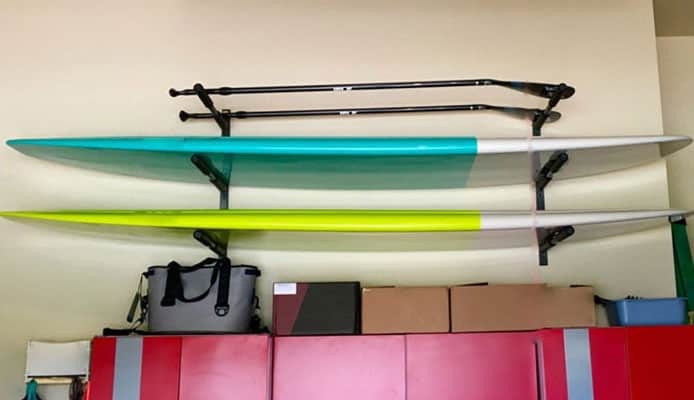 If your board is hanging out, or is a hanging behind your car a significant amount, it’s a good idea to put a red flag on the end of your stand up paddle board. This will warn other drivers that your car is longer/wider than normal so that they can stop farther away from you. Make sure your stand up paddle board is parallel with the car and the widest part of the board is centered between the crossbars of your rack. Take the first cam strap and place the buckle on top of the board but close to the edge. The cam strap should also be close to one of the crossbars. Throw the other end of that cam strap over your stand up paddle board. Go to the other side of your car and grab the strap that you just threw. Loop it underneath the crossbar and throw it right back over your board. Ensure that the cam strap is through the inside of the opening where your vehicle and crossbar meet so that the strap can’t fall off. Go back to the side of the vehicle you began on and pull the strap underneath the crossbar and up to the buckle, engaging the buckle. Double check that this strap is also through the opening where the vehicle and crossbar meet. Do steps 1-4 with the other crossbar and cam strap. Make sure that both cam straps are snug, but not too tight. Your stand up paddle board can become deformed from too much pressure. Take the two loose ends of the straps and tie them together below the buckles themselves, then take care of any slack by tying it to the crossbar. This makes sure that you have no part of the straps flying with the wind while you’re driving. Double check that your stand up paddle board is secure by shaking it around and seeing how much it moves; it’s better to be safe rather than sorry. Take the part of the line with the ratchet and attach is to a secure point on the back of your stand up paddle board. Take the other end of the line and secure it somewhere on your vehicle that’s not plastic. Tighten the line by pulling the free end until it’s tight enough. Be careful not to overtighten it and cause your stand up paddle board to be deformed. Tie the loose end below the ratchet. Do the same things for the bowline. Use a ladder if you need to, there’s no shame in being short! Twist the cam strap once. This will prevent any noise, like vibrations, while you’re driving. These can be worrisome and distracting. Buy a lock for your cam straps. This is perfect in case you have to stop for food or at a gas station. Make sure to stop frequently to check that your straps are secure. They can easily loosen while you’re driving.